Three judges, Ms. Sok Chan Chhovy, Program Officer of OXFAM (Left), Ms. Thida Khus, ED of SILAKA and Chairperson of CPWP (Center), and Mr. Heng Sovann, Journalist (Right). Around 100 people from diversity gathered in a hall of Pannasastra University of Cambodian south campus, to listen debaters under topic “Women in Leadership” on 20 Feb, 2016. 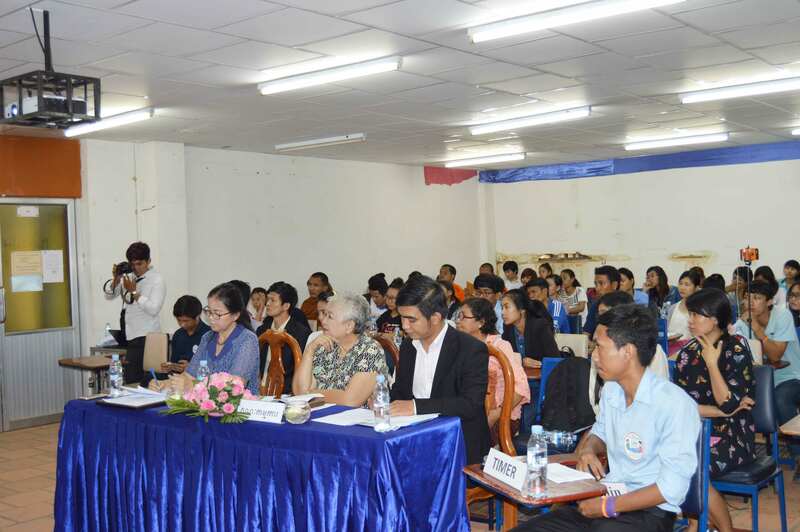 Debating competition organized by Joint of Youth-Cambodia (JOY-Cambodia). The debate aims to open a peaceful space to analyze and demonstrate about women’s capacity in leadership, and to divert social mindset and youth’s behaviors to understand that currently women are smart enough, brave enough to work as a leader. Mr. Kim Sea, representative of Youth Council of PUC said “the debate under topic women in leadership is a good occasion to publicly demonstrated about women’s capacity in the 21st century”. He added that “sustainable development needs women”. Joint of Youth-Cambodia will be organized two more events before International Women’s day. On 02 March, Photo Contest under the topic “Women’s movement in the 21st century”, and 05 March, Women Corner, this workshop will share more experiments that related to women leaders in decision-making, human rights, education, and technology. The Committee to Promote Women in Politics sub-granted funding to Joint of Youth Cambodia to run their activities for promoting women in leadership, and building youths capacity. Currently, SILAKA holds the Secretariat of Committee to Promote Women in Politics. CPWP is implementing a project named Claiming the Rights for Our Sister (SROC), which funded by OXFAM.